These prophecies have been passed down from generation to generation in indigenous cultures and communities that have been able to keep at least a small flame of their traditions alive. Some have coded the information in such places as wampum belts, carvings and rock paintings; others through the teaching stories that are often told by the grandparents to the grandchildren as is the practice in many North American tribes. There is a similar prophecy among Native people of North America called the Seven Fires Prophecy. It’s said that in the old days when the people lived in peace and fullness, seven prophets came to the Anishnabe people and left them with seven predictions. In the time of the Seventh Fire, New People will emerge. They will retrace their steps to find what was left by the trail… The task of the New People will not be easy. If the New People will remain strong in their quest, the Water Drum of the Midewiwin Lodge will again sound its voice. There will be a rebirth of the Anishnabe Nation and a rekindling of old flames. The Sacred Fire will again be lit. One might envision this time of the Seventh Fire as the ripening of accumulated karma, the consequences of centuries of uninitiated, soulless behavior, being drawn vortex-like into fires of purification. Elders are saying that we are into this time of fire now and that much is at stake. This is a time when the collapse of apparently solid systems has created openings. There’s great possibility in the air right now. And although I don’t believe in focusing on worst-case possibilities, it must also be acknowledged that some are also saying that the window of opportunity available to shift priorities away from the material illusion may now be all but closed. Scientists sometimes use the term “the tipping point” to describe systems that have reached a point of no return. Some have suggested that the tipping point for Earth as a system may not be far in the future, especially if there isn’t a radical realignment of priorities in these next few years. In that scenario, elders have said that the only way to view the times coming is for us to get our relationship to Spirit straight, pay attention, and stay present in the face of whatever chaos may unfold. The prophecy points to the joining of visionary energies from the four directions of the planet, and as I write this, signs of this worldwide confluence are appearing with increasing frequency. There are conferences taking place and associations being formed at meetings between highly regarded wisdom carriers from many different traditions. Shamans from ancient indigenous cultures are gathering with spiritual leaders from major religions to share their versions of this prayer and their teachings for liberation. The Dalai Lama, for example, has attended some of these summits side by side with shamans from places as far-flung as Ecuador and Nepal. A vision held by some and shared with me by Native American spiritual elder and visionary Kanucas, says that the “blizzard of the world”—the juggernaut of the modern machine—and the stability of living conditions in general, will experience a moment when all the neurons seem to have clicked into place and conditions of breakdown will spread more or less suddenly. During the lead-up to this moment, those inspired by and committed to the manifestation of the vision for planetary awakening are working at multiple levels to encourage and build the necessary links. According to this vision, there will be a kind of crossfade where, as the old world falls apart, something inexplicable will occur to manifest the prayer shared by initiated people from the four directions. My first book is Returning to Sacred World: A Spiritual Toolkit for the Emerging Reality, published in November 2010 by O Books, an imprint of John Hunt Publishing in England, a good source for a wide range of books on spiritual/healing subjects. I have a long article in Shaman’s Drum magazine from issue #77, summer 2008 entitled Walking With Grandfather Peyote and Other Sacred Plants. I also have an article titled When Prayer Meets Medicine at Daniel Pinchbeck’s excellent and popular website Reality Sandwich. Daniel has become one of the leading spokespeople for planetary consciousness transformation through his books, essays, personal appearances and the website. Sacred Hoop magazine from England has also published an article of mine called Heart of the Great Spirit in issue #66. Here’s what I believe makes the book different and hopefully a valuable contribution to the dialogue on consciousness transformation. Indigenous prophecies and the visions of wisdom carriers speak of “uniting the four directions” of the planet in a powerful collective prayer and intention to heal the world. My experience with the Native American Church and other shamanic/indigenous paths has put me close to both the center and the leading edge of this vision, which many people in these worlds say comes directly from Spirit. The call is for us to transcend boundaries, limitations, and exclusivity of all kinds, and to have confidence that through our individual and collective confidence and commitment, we can actually realize the vision of a sane, awakened world. The thrust of the book parallels the vision in its integrative, syncretic approach. It’s divided into three main sections. The first section lays the foundation for understanding how we’ve come to this nexus of crisis and potential transformation and how we can shift out of old, dysfunctional paradigms. Themes here include: the history and consequences of the spiritual disconnect of the “dominator” mode of society; visions and indigenous prophecies describing this time; reclaiming the feminine principle in the conduct of human affairs; wisdom of the Earth-based peoples; the deepening, multilevel planetary interconnectedness; the essential role of art in creating enlightened societies; revisioning economic and community relationships; and opening to the living Gaian mind and its teachings. Through discussion and guidance regarding some of the most powerful healing/awakening tools and techniques we have available to us in this time of urgency, the final section offers readers effective means to realize in their own lives the vision described in the first section and the practical teachings presented in the second section. I’ve worked extensively with all of the practices and medicines discussed in this section. There are in-depth chapters on the two most universally accessible of such “tools;” mindfulness/awareness meditation, and prayer, particularly as these are taught and practiced in Tibetan Buddhism and in the Native American Church, respectively. The last five chapters describe several remarkable spirit-medicine, healing, entheogenic plants. The testimony of many wise and humble people is that there are authentic indigenous traditions which have expertly and safely worked with these plants and which provide effective models for their use. The vision is that these plant allies are here to play key roles in the planetary awakening. David Jay Brown coauthor of Conversations on the Edge of the Apocalypse and Mavericks of the Mind, periodic guest editor for MAPS. Returning to Sacred World is an unusually articulate integration of ancient mystical wisdom and contemporary personal insights about how consciousness is shifting and transforming during these evolutionarily-crucial times. Stephen Gray has a strong, clear voice, and a wide-ranging, shamanically-knowledgable perspective. Hopeful, inspiring, and thoughtfully-written, the distilled wisdom that Gray presents in this precious volume is just what our wayward species needs–to help us awaken our higher selves from their spiritual slumber, and guide us through the impending global crisis toward a promising new horizon. Martin W. Ball Ph.D., author of several popular books on entheogens, including: Mushroom Wisdom, Sage Spirit, and The Entheogenic Evolution. 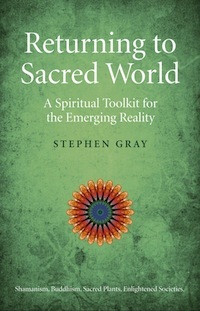 Stephen Gray offers his readers a rare and unique gift with this wonderful book, bridging the divide between Buddhist teachings, Indigenous traditions, and the wisdom of the world of visionary plants and traditional medicines. Gray presents an in-depth look at the current spiritual, personal, and planetary crisis facing contemporary society, examining both the roots of our problems as well as sources of inspiration and teaching to help heal us of our self-imposed wounds and illusions. Filled with personal stories, inspiring quotes, and deep wisdom, all presented from the perspective of a humble spiritual seeker, this book is sure to provide answers for many who find themselves on the spiritual path and who seek their own healing, as well as the healing of our world. Stephen is very real and a pleasure to be in conversation with. His book is excellent and a delight to read in a most refreshing way. His clear instructions will give readers the grounding, confidence, and encouragement to work with any of the medicines. As owner of one of North America’s leading spiritually-focused book stores for 38 years, I have also been the person responsible for choosing the books that we sell. Stephen Gray’s book brings a unique, widely-seasoned—personally fascinating!—and integrative perspective on the awakening journey in these tumultuous times. He doesn’t shy away from the hard parts, and his authenticity and humility make this important information engaging and digestible. Dee Axelrod former senior editor at YES magazine, journalist, novelist (forthcoming nonfiction novel Spy Moms with Guideposts), and Native American Church elder. I have been a professional writer and editor for many years. I’ve given Stephen’s manuscript a thorough read and have no hesitation in endorsing Returning to Sacred World as a valuable contribution to its field and an important book for anyone who cares about the future of the human endeavor. To put it in no uncertain terms, these are brilliant ideas whose time has come, and not a moment too soon. Stephen is also an excellent natural writer, the organization is coherent, and the central concern—that we are in the midst of a great transformation on this planet—presents a clear and passionate call to spiritual awakening and active engagement. former senior editor at YES magazine, journalist, novelist (forthcoming nonfiction novel Spy Moms with Guideposts), and Native American Church elder. John Wellwood journalist and senior editor of Echo Memoirs Publishing, Vancouver BC. Stephen Gray presents a compelling, and at times provocative, array of insights into our world’s growing crisis of well-being and the spiritual and day-to-day means available to all of us to heal and flourish. I firmly believe this work is unique in its encompassing scope and extremely important for our times. As an editor and writer of long experience I can also say with confidence that Stephen is a natural writer, able to communicate his message with clarity and to keep his reader fully engaged from start to finish. Susan Ravagni reviewer for bookpleasures.com, a worldwide online book review site. Is there some ancient, dare I say sacred, wisdom to which we should return? Self-described journeyman and journalist, Stephen Gray gives a resounding, “YES”. In Gray’s exceedingly well-written and eloquent book, Returning to Sacred World, he gently guides the reader into the realms of the divine via a fusion of his personal, life-long studies of numerous cultures. If you think this sounds suspiciously like Eat, Pray, Love, let me assure you that Gray’s composition moves well beyond that. Let’s call Returning to Sacred World version 2.0. Maybe even 3.0. Or maybe it’s a whole different animal altogether. Gray’s explorations – or more precisely, immersions – have taken him from studying under the much-esteemed Buddhist teacher Trungpa Rinpoche to engaging in shamanic South American practices to learning the indigenous teachings of the Native American Church. Taking aspects from each that resonates with him, Gray provides a syncretic (blending of different beliefs and practices) viewpoint that will engage the reader. I could provide you here with several dry paragraphs that it would not do justice to this amazing work. No. Let’s not do that. Instead I’d like to share how reading this affected me. As Gray lays down his case for our need to recognize our spiritual disconnection, I found myself underlining more than several concepts. I was inspired to write “yes” with exclamation points in the margins at several points. I even gave one sentence a “wow”. I’m not going to tell you what that was, though. You have to read Returning to Sacred World yourself and find your own “yeses” and “wows”. By the end of Part 1, I was in agreement with Gray that now, more than ever, we need to awaken and transform. How is this done? In the second part Gray dives into Buddhism. This is not light reading. I attempted to wrap my technology-based, western-thinking, Judeo-Christian indoctrinated mind around some of the concepts. I have looked at these before and, frankly, had given up. Gray gave me hope with his exhortations to let go of dogmatic teachings, continue to seek without judgment, trust my inner guide, and, most importantly, to relax. And breathe. I could almost hear him sympathetically chuckling at points. In the last section Gray provides applicable tools to further one’s practice; the spiritual journey. Gray explores the inner connections to the divine: prayer, chanting, one point and still point meditation. Gray then plunges down the rabbit-hole of using substances, entheogenic (from the Greek, that which causes to be in God) and empathogenic (causing an expansion of feelings for others), to break down the ego boundaries. He explains that plant-based medicines are ideal (as opposed to laboratory manufactured) and should be experienced in the correct setting, namely under supervision by those who have studied and know how to use these substances. Although controversial, Gray maintains that mindfully using one or more can be extremely helpful in transcending ego and furthering the awakening process. I found myself intrigued. Because of Gray’s experiences and ability to speak with an authentic voice, I would have liked to have seen him touch upon other meditative practices such as the Melchizedek method or his thoughts on doing daily affirmations as popularized by The Secret. If he explored these at all, he made no mention. That’s okay. Gray inspired me to form a personal syncretic practice as I move into my own Sacred World. And I think that was his ultimate goal. My recommendation for fellow seekers: read Returning to Sacred World, you won’t regret it for an instant.